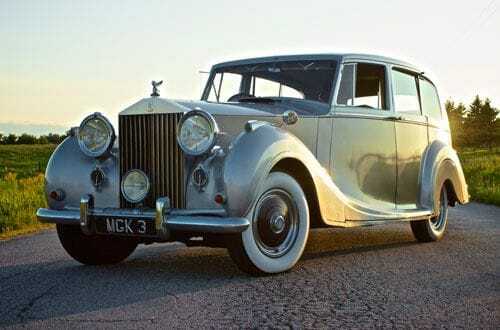 With A Rolls Choice Livery every client is assured of being given great service with a vintage feel. If you want to arrive in style to your wedding, or special event, the 1949 Silver Wraith Rolls Royce should be your number one choice! This luxurious, classic Rolls Royce is very popular with our clients. The unique grill makes it a show stopper on any occasion. This coach-built vintage limousine can seat 5-6 passengers, and is right hand drive. There is a division between the front and the rear compartments, giving the passengers extra space and a little privacy. Two extra rear seats can be pulled down if required and the rear seating area has a pull-down picnic tray to allow for champagne toasts! This unique classic car boasts suicide doors, a unique feature that attracts a crowd no matter where you drive! The 1949 Rolls Royce was originally owned by Gillette Industries and was purportedly sold to Prince Radswill of Poland, who married Lee Bouvier, Jaqueline Kennedy's sister. This unique, vintage limousine is 1 of only 13 in the world!